At Golden LivingCenter – Continental Manor of Randolph, providing compassionate care is our top priority. 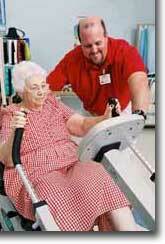 We are located in Randolph, Wis., and we provide a variety of health and rehabilitation services. Whether your loved one needs short-term rehabilitation, long-term care or just a little bit of help with daily activities, our staff has the resources to meet his or her needs. Our facility has access to Beaver Dam Community Hospital and features gorgeous landscaping and gardens. Because we understand how important recreation is, we offer many different activities to fit your loved one’s interests.